TalenTreee are looking for female dancers over 5ft5 for a two month contract in India. 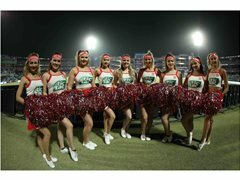 Work will involved cheerleading for one of more teams at the IPL, which will mean traveling all over the country for cricket matches. This is a great way to explore the country, in previous years days off have been spent at the Taj Mahal and exploring Monkey Temples. We also have a company office based in Mumbai where our girls work on Bollywood shoots and performing at live events, functions and weddings. Depending on schedules, there is a chance for dancers to get involved in this also. All flights, accommodation and visas will be provided, as well as food whilst working. For more information and to submit your interest, please get back to us with your CV, pictures and some footage of you dancing. Strong dancers with great performance skills, 5ft 5 and over. Willingness to work as a team and adapt to any last minute decisions and changes.